We stopped in this month at the far “north” of Utah, a wilderness outpost in southern Montana where the University of Utah runs their Environmental Humanities Education Center. Located in the middle of the remote Centennial Valley, the center provides opportunities for students and artists of a variety of genres to explore their interests nestled in a unique setting. Moose cavorting in the willows, scores of trumpeter swans skiffing along the lakes, and miles of pines and aspens provide a contemplative setting for writing, painting and more. This year’s season of visitors was capped off by the Centennial Valley Arts Celebration, and while we were there we stopped in with Frank and Louisa Carter, this year’s Artists in Residence. The young couple are both at the University of Utah pursuing graduate degrees and were able to spend three months tucked away in a log cabin to work on their projects, all the while interacting with visitors to the center. 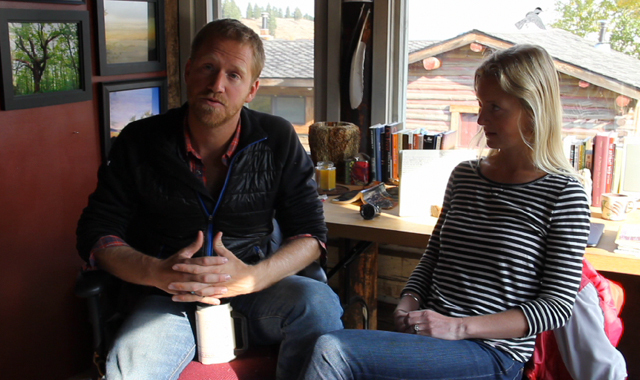 In this interview, the pair discusses their individual projects, what the residency has meant for their work and sense of community, and what it feels like to write books and songs surrounded by aspen meadows. Watch a video interview and here one of Frank’s songs in the October 2012 edition of 15 Bytes. Very intriguing couple making terrific use of unfettered time and unending landscape. A great reminder about mindfulness. Please linger longer on bookshelves in these profiles. I like to know what people are reading and need more than a passing glimpse of titles to absorb them. I highly recommend a visit to Centennial Valley, perhaps during next year’s Arts Celebration. As Frank and Louisa point out there is something special about this place that allows creativity to flow from beyond the human world.